Accessories are considered a way to help increase the beauty of a woman. There are different types of accessories, which are seen these days like bracelets, armlets, scarves, anklet etc. Earring is one type of accessory wearing which a woman will look beautiful and stylish. Different types of earrings are available in the market. With the help of earrings, one can make a style statement for herself. Chandelier Earrings: This earring has a look like chandelier and hangs loose from the earlobe. Like dangling earrings, this earring too can be found out in different lengths. Nevertheless, in this earring unlike dangling earrings, levels of branches are made and they hang out giving a chandelier appearance. Post or hook can be used to affix this earring. It is a handle-with-care type of earring. Dangling Earrings: This earring hangs loosely through the earlobe and is affixed with the help of a hook or a post. There are varieties of dangling earrings, which you can see in the market as this earring too goes with any dress you wear. These earrings come in different sizes and in different length. The length of these earrings can just end at the height of the chin or can go till shoulders too. These earrings come in different shapes and can have gemstones, jewels, beads or other artificial jewelry to make the earring look beautiful. Hoop Earrings: It is the most common type of earring worn by women. It is circular in shape and hangs out from the earlobe. Along with circular shape, this earring comes in square, oval shape too. Not only earlobe is the place where hoop earrings can be worn but they can be pierced at helix, snug and tragus. Spring hoop, wired hoop are the two types of hoop earrings. Stud Earrings: This earring is the simplest of all the earrings to be worn. It doesn’t dangle or is very big in size. It is small or medium in size and just fits at the earlobe with a post at the back. It looks good on any outfit you wear. There are diamond studs or other jewel studs available in the market. There are many designs available for stud earrings. Threaders: It is a very stylish kind of earring. It is very long and looks thin like thread. It passes through the earlobe and is left to dangle in the air in front and back of the ear. You can also see threaders, which just hang loosely from the back of the ear, and in front, they are as if studs attached to earlobes. There are gemstones, beads on one end of the earring. 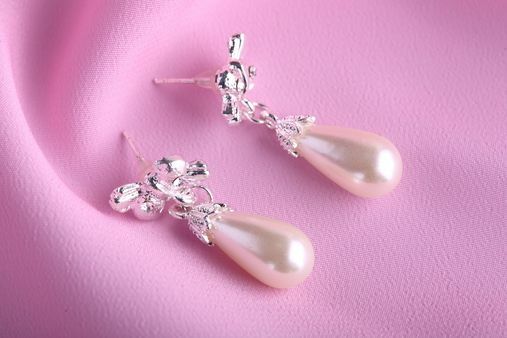 It is very delicate and cool earring which should be worn with due care. Along with the above types, stick-on earrings, clip-on earrings, omega back and slave earring are also some of the other types. Earrings look lovely on any face shape and increases beauty of the face.